Better priced: For cruises departing at one of these alternate cruise ports, you will often find that the prices are lower and the value is higher. Why? Reasons may vary from how old the ship is to what time of year the cruise sails and when you book. 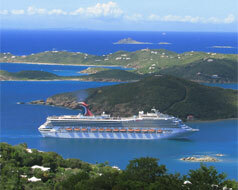 Look at cruises departing from places such as Orlando, New Orleans, Galveston, and Tampa. Lower Airfare: For common cruise ports, airports in those areas are swamped with people traveling to and fro to catch their cruise. This causes a higher demand for flights, thus resulting in higher priced airfare. Not only do you get a better chance at paying a better price for your airline ticket, but often the airport is less crowded in areas of alternate cruise ports. Word of Caution: While there are a few new ships that dock at these alternate cruise ports, you will often find that older ships are docked there. If you are looking to sail on a newer ship, be aware of what cruise you are booking. When those cruise cravings start to sneak up, remember to look at the ports in your cruise itinerary and save even more money on your already great priced cruise. Now you know another way to save some big bucks!